The PIAC pension plan composite average asset allocation for 2016 changed little from previous years. One of the arguments this blog has made is that the Pension Investment Association of Canada (PIAC) composite average asset allocation can be a useful benchmark for individual investors who need a starting point to construct and manage their personal investment portfolio. Individual investors looking for a strategy for their own investment portfolio can simply mimic the PIAC asset allocations. 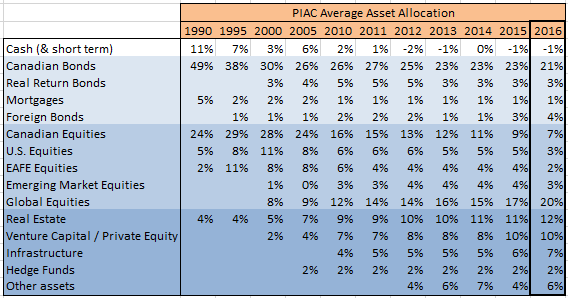 Blog readers will note that the PIAC composite average asset allocation continues to change over time. 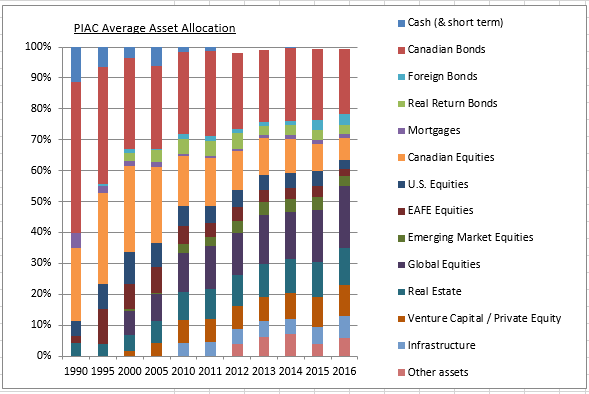 The Alternatives asset class continues to increase at the expense of both Stocks and Bonds and especially Canadian Stocks. “About two-thirds of pension assets are managed by the eight largest public pension funds in Canada.” Because the top eight Canadian pension funds and PIAC are broadly representative of pension funds, Individual investors who seek an investment strategy for their own investment portfolio would do well to piggyback off of institutional pension strategies. The rationale for this strategy is described at length in Why PIAC in previous years PIAC composite average asset allocation updates. (Search Why PIAC on this Blog). PIAC does not publish average plan returns but we can use a proxy measuring stick – the RBC Investor and Treasury Services Pooled Fund Survey for the period ended Dec 31, 2016 indicates the average active balanced pooled fund in Canada delivered 7.3% for 2016. For longer term returns click the chart above. By following the PIAC average asset allocation strategy, one could expect returns that approximate RBC’s average return. The RBC report is also available on this blog site under Tools.